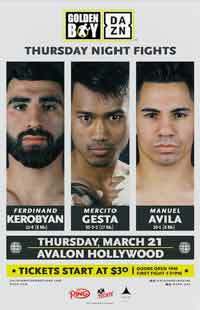 Review by AllTheBestFights.com: 2019-03-21, pretty good fight between Mercito Gesta and Juan Antonio Rodriguez: it gets three stars. Mercito Gesta entered this fight with a professional boxing record of 32-2-2 (17 knockouts) and he is ranked as the No.38 lightweight in the world. He fought twice last year losing to Jorge Linares (Jorge Linares vs Mercito Gesta) and beating Robert Manzanarez (Mercito Gesta vs Robert Manzanarez). His opponent, Juan Antonio Rodriguez, has an official record of 29-7-0 (25 KOs=86%) but he is not ranked as he hasn’t fought since June 10, 2017 when he was defeated by Pedro Campa; before this bout, in 2016, he had beat Raul Hinojosa. Gesta vs Rodriguez is the main event of the evening. Watch the video and rate this fight!